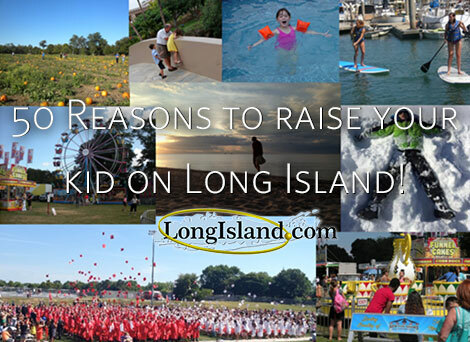 Taking off from “50 Reasons Why We Love Living on Long Island,” we also want to give you 50 reasons why you’d want to raise your kid on Long Island. As every good parent will do, you want to offer your child an environment that will allow them to grow and develop as happy babies, toddlers, big kids, teens, to young adults. Long Island is the place to do that for many reasons, but here are just 50 reasons to get you started. After going over these reasons, you’ll see why it makes a wonderful place for your child to begin building great childhood memories here and why so many parents have chosen Long Island to call home! Education is number one for many families when it comes to deciding where to raise their kids, and fortunately, Long Island has some of the top-rated schools in the country. It’s so important for today’s children to get exposure to diversity because that is the world we live in today. Fortunately, Long Island offers a diverse population for children to learn about different backgrounds and nationalities whether it’s at school or play at the park. Health and well-being is an important part of living a happy life. Those on Long Island are fortunate to have access to top-rated doctors and hospital systems. 4. Open Space for Play! Being so close to New York City where there are typically cramped living quarters, Long Island is a different world. Kids growing up on Long Island have open space for playing and running whether it’s in the backyard, playground, parks, or beaches. 5. Museums Located All in One Place! You can make it a full museum day with the kids easily by making a visit to Museum Row where there’s the Cradle of Aviation Museum, the Long island Children’s Museum, the Nassau County Firefighters Museum and Education Center, and the developing Long Island Museum for Science and Technology. 6. Kid-Friendly Museums for Interactive Play and Learning! If you’re looking for museums specific to entertaining kids, Long Island has it with its many kid-friendly museums. 7. Halloween Fun Is Right at Your Door Step! Long Island goes all out during Halloween! You have the haunted houses, pumpkin patches, corn mazes, and so many other Halloween fun activities to do with the kids that are just steps away from your home. 8. Family Vacation Travel Planning is a Breeze! 9. Get Close to Farm Animals All Year Round! Who said you have to travel far for a farm?! Right on Long Island there are plenty of farm animals for petting, including fun annual events like sheep shearing. 10. Skating Fun to Be Had All Year! Whether its ice skating or roller skating your child enjoys, Long Island offers a number of outdoor and indoor rinks for skating fun every day! 11. Holidays with Lasting Traditions and Memories! Yes, the holidays are a great time to get the family together, but kids also enjoy the seeing beautiful holiday lights. Long Island has several popular spots for it every year including the Girls Scout of Suffolk County Holiday Light Show and the Holiday Lights Spectacular at Jones Beach State Park. 12. A Trip to the Big Apple is a Breeze! When you want to head out to the City with the kids, it’s a breeze because by car or LIRR and train, it’s a short ride out. 13. Cool Sports to Take Part In or Watch All Year Round! Getting your kids into sports is easy on Long Island with the many sports programs offered. If you and your child just wants to be spectators then there’s also games to watch with the Ducks (baseball), Dragons (football), the Rough Riders (soccer), and Lizards (lacrosse). 14. Live Theater Performances to Enjoy Every Weekend! Live theater is not just fun for adults, but for kids too on Long Island! Many of the theaters offer kid-friendly performances. Catch a performance at the John Engeman Theater in Northport or the Theatre at Westbury. 15. Adventure Parks Close to Home! Want to get your kids excited? It’s easy on Long Island with the many adventure parks, including places like Adventureland, Bayville Adventure Park, and Splish Splash. 16. Fruits and Vegetables Available for Picking Any Time of Year! With the many local farms on Long Island, you and your kids can get their hands on fresh fruits and vegetables easy. It’s also always fun to go pick them yourself. When your child doesn’t want to go far away after high school, she’ll have plenty of options to choose from on Long Island. Some of the colleges and universities here include Hofstra University, Adelphi University, Stony Brook, and Long Island University. 18. Wide Array of Summer Enrichment Programs! Many of the colleges and universities on Long Island open up their campus to young children for summer enrichment programs. There’s also so many wonderful summer day camp program options you can find that’s specific to your child’s interest. 19. Kids Can Get Excited about Science Easily! Science is an important part in a child’s education, and it’s fun! Long Island is home to many science centers and museums like The Long Island Science Center, Girl Scouts of Suffolk County STEM Center, Mad Science of Long Island, Brookhaven Lab Science Museum, and the Science Museum of Long Island – to name a few. 20. Learning to Ride a Bike is Possible Along the Many Scenic Bike Paths! Keep children active and in touch with nature while riding a bike. There are so many scenic bike paths you can take together. 21. Fishing Fun Can Be Had Practically Any Time! Get the fishing pole, bait, and hook ready for a fun day of fishing! There are so many spots and boat rides available on Long Island that your child will become a fishing pro in no time! 22. Supportive Environment for Reading! Between the public libraries on Nassau and Suffolk Counties and the bookstores on Long Island, your child can find reading materials to enjoy all the time. Many of the libraries and bookstores also host programs suited for young readers. 23. Easy Escape to the Beach on Summer Days! Kids love sand play and fortunately Long Island is home to many kid-friendly beaches. It’s also home to the widely popular Jones Beach! 24. Great Parks for Kids to Enjoy! Whether it’s basic playground equipment, bike trails, hiking trails, sprinklers or a place for a family picnic you’re looking for, Long Island has so many great parks for it. There’s Sunken Meadow State Park, Caleb Smith State Park, and so many others. 25. Fairs & Festivals to Enjoy All Year Round! Every season of the year, there are always fairs and festivals to enjoy with the family on Long Island. 26. There's an Island Free of Vehicles! A trip to Fire Island is fun for adults and kids, and if you live on Long Island that means you only have a short ferry ride over. No cars are allowed on the Island. 27. Outdoors Fun is Possible During the Cooler Winter Months! While others are cooped up indoors during the cooler winter months, on Long Island you can go out for a fun activity like seal watching in their natural habitat. Seal watching is quite a popular activity during the winter on Long Island. 28. Free Events to Enjoy! A fun day out with the kids can get pricey, but on Long Island it doesn’t have to be because there are plenty of free events to enjoy with the family! 29. Suburbs, But You’re Not Out of Touch with the City! If you want to raise your child in a suburban area, you have it with Long Island, but you’re not totally out of touch with the big metro city life because New York City is a short ways away. 30. Experience All Four Seasons of the Year! There’s different things to enjoy and appreciate with every season and living on Long Island allows the kids to experience all four seasons! 31. Options for Clothing Shopping Are Plenty! When it’s time to add to the wardrobe for the new school year, you have plenty of options on where to go to shop for kids clothing with the many malls and the Tanger Outlet on Long Island. Yoga is great for adults, but it can be just as good for kids! Long Island has plenty of yoga centers for kids. 33. Get in Touch with Nature and Have Fun Doing It! Children can explore nature safely and openly at places like Sweetbriar Nature Center and Garvies Point Museum and Preserve. 34. Plenty of Places for Apple-Picking Come September! Long Island offers plenty of apple orchards and farms to enjoy apple-picking every September! 35. Open Play Places For Kids to Let Out Their Energy! Kids have so much energy in them that at times it feels like torture if they can’t let it out. On Long Island, you can set them off to jump, run, laugh, and have fun at many open play places – it’s perfect for when the weather outdoors is less than pleasant. 36. Local Landmarks Suitable for Educational Fun! When you and the kids get tired of the typical stuff set off for the unique and off-the-beaten path with local landmarks on Long Island. There’s the lighthouses, the Big Duck, Shinnecock Pow Wow, and other local landmarks to visit. 37. Day Trip Options are Plenty! Long Island’s extensive towns, villages, and hamlets give families lots to see and discover even when you’re a local LIer. Many places make for a great family day trip! 38. Staying Fit Comes Easier with the Many Hiking Trails! When you have multitude of trails for running, jogging, or for casual walking, staying fit is easy and enjoyable. 39. Get Family Quality Time with Camping Trips! Take the whole family camping and let go of the video games, mobile devices, and all else that takes away from quality family time. Long Island has many campground sites that are also pet-friendly. 40. Aquariums Kids Will Love! Animals of the sea and marine life are wonderful to watch! Long Island is home to the Long Island Aquarium and Exhibition Center and the Cold Spring Harbor Fish Hatchery and Aquarium. 41. Summer Camp Options are Endless! When school’s out and you have to keep the kids entertained and their mind active, summer camp options on Long Island are plenty. Horseback riding is a great activity for kids! Long Island has several locations for horseback riding lessons and to get involved in equestrian competitions. It also has the oldest cattle ranch in the country. 43. Whale Watching is Available During the Summer! Getting a glimpse of the great whale is a unique experience and families on Long Island get to enjoy it during the summer months. Take a trip out to the Long Island Sound and along the South Shore for a glimpse. 44. No Problem Finding Extra Help for Kids After School! When kids need extra help after school, there is help available. Long Island has a number of after-school programs suited for academic enrichment. 45. Plenty of Options to Learn How to Swim! When you have easy access to facilities for swimming, the likelihood of kids learning how to swim also goes up. On Long Island, there are a number of public pools available to help kids learn to swim. 46. Local Events Suited to Kids! You can easily find local events for kids on weekdays and weekends, especially with the many local library events for movies, game nights, arts & crafts, and more! 47. Option to Become a Boy Scout or Girl Scout! Beings a Scout empowers kids to do what’s right and it teaches them values of honesty, fairness and courage. Long Island is home to Girls Scouts of Suffolk County and Boys Scout of America. 48. Opportunities to Teach Kids about Helping Those Less Fortunate. Community service and volunteering teaches children the importance of helping others, especially those less fortunate. On Long Island there are many charities who can use help to support local needs. 49. There’s the YMCA of Long Island! There’s so much to the YMCA that helps families across the country. Long Island is fortunate to have several YMCA locations for exercising, education, and more! 50. It Has an Aerial Adventure Forest! Adventure Park at Long Island provides wooded acres for the outdoor thrill seekers. You can let adventure really come to life for kids with zip lining and aerial rope challenge courses! Are you a parent raising a child on Long Island? If you have a reason not listed here, let us know! Pictured: Christina L. and her daughters Jacqueline & Mackenzie, of Mineola.